Just Ducky: Take this, you Vegan enablers of industrial destruction! Take this, you Vegan enablers of industrial destruction! Mother earth never attempts to farm without live stock; she always raises mixed crops; great pains are taken to preserve the soil and to prevent erosion; the mixed vegetable and animal wastes are converted into humus; there is no waste; the processes of growth and the processes of decay balance one another; ample provision is made to maintain large reserves of fertility; the greatest care is taken to store the rainfall; both plants and animals are left to protect themselves against disease. 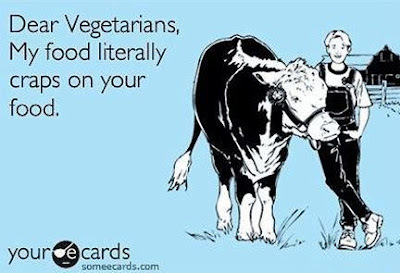 Most arguments I've heard from folks about vegetarianism or veganism I just don't buy. Healthwise, it's not necessary. Though I do agree with Thomas Jefferson's view to treat the meat almost as a garnish and not the main component of a meal. But you can eat meat and be quite healthy. Environmentally, encouraging systems without animals is - as Howard says -- destructive and you're going to encourage many bad practices of industrial farming. Small, diversified farms need animals and they need markets for those animals to work economically outside of the transaction-oriented, industrialized system of agriculture today. Much of the planet is not suited for growing annual crops, which is where most of our grains and vegetables come from, and which need annual tillage (whether powered by internal combustion engines or beast of burden). Most of our surface area is best left to grasses and fobs, harvested and converted into human food by the grazing of cows, sheep, goats, etc. Now the grazing needs to be managed, but none the less it's the best long-term, sustainable way to produce human food off most of the earth. And some people are just uneasy about eating meat, but I suspect that's more a combination of the Beatrix Potter Syndrome (or Disney Syndrome or whatever -- anthropomorphism via media) and not growing up with and around livestock. Farm kids are taught to not name their future food (at the parent's peril if they don't teach that lesson), but through media many people have "named" all their food. Nor can one argue that eating meat necessarily supports poor practices like confinement animal factories -- it may, but it doesn't necessarily. And someone who refuses to eat meat even when it raised right on small farms and with much freedom of movement and safety is refusing to support the farmers who do the right thing.